Benjamin Corey is an author, speaker, and blogger who frequently travels internationally, so he knows part of the travel game is for some locals to try to rip off unsuspecting tourists. He’s always on his guard and knows most travel scams. But after his flight to the Democratic Republic of Congo was delayed by a few hours, he found himself stranded outside the airport without his designated ride. We were reminded of Benjamin’s story after seeing a Mental Floss article about several different travel scams flogged on unsuspecting tourists. Here are a few of our “favorites,” and how you can avoid them. The Store Scam: A local starts up a conversation and mentions that his family owns a local store where you can get great deals on local goods. Deals that sound too good to be true (which should be your first clue). When you go to the store, you will be extorted and badgered for everything you have, and the deals aren’t that good to begin with. The Change Scam: Merchants will often try to not give you exact change back, or give you change with incorrect exchange rates. To prevent this, carry small bills/coins or pay with your credit card. This helps you avoid getting shortchanged on the exchange rate as well. The Distraction Scam: You’re walking down the street. Someone bumps into you, spilling their drink or food on you in the process. They apologize and try to help clean you up, or so you think. 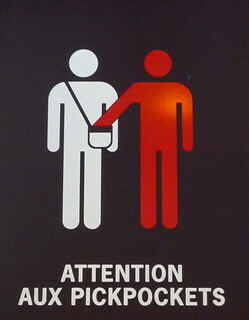 You were actually just pickpocketed. Keep your money secured on your person, and don’t carry everything with you. The Fake Cop scam: If a cop asks for you to pay a fine on the spot, he’s most likely looking for a bribe. Respond by politely saying you will only pay at a police station. Stick to this answer even if the cop becomes loud and aggressive. The Dropped Ring Scam: A local will say he found a dropped gold ring, which likely isn’t even gold. He will give it to you, then demand a finder’s fee. He may even begin shouting to attract attention in the hopes of embarrassing you into paying. Don’t accept the ring in the first place, and just walk away. Drop it again, if necessary. In all cases, it’s best to walk away from the situation as soon as you realize what’s going on. Never hand anyone your money, your camera, or any of your belongings. Keep your wallet and money in a secure place. And always take an official taxi; never accept a ride from a local.